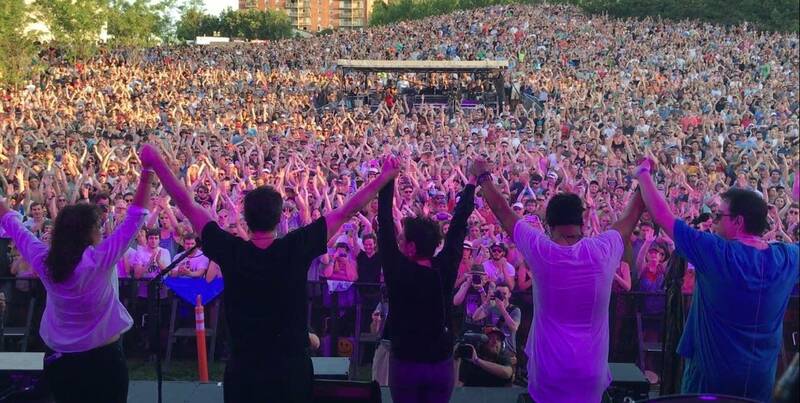 From concerts to art shows to festivals, you've got no right to say you're bored in the Twin Cities this weekend. However, construction and the temporary closing of light rail stations in downtown Minneapolis will make getting to the entertainment trickier than normal. As MPR News reporter Euan Kerr reports: The popular Northern Spark festival returns to the Twin Cities this weekend with two big changes. The art festival is free and happens rain or shine. First, it's not running all night. It will wrap up at 2 a.m.
Second, it's running for two nights — this Friday and Saturday — instead of just one. The organizers say the new format responds to patrons who didn't have time to see everything. For more information on what you can find there, check out this article. For a family-friendly experience complete with art, food, music and a cool car show, make your way over to the Minneapolis Riverfront along northeast Main Street a weekend-long celebration. You can check out local vendor booths, enter a sampling tent for some tasty beer (make sure you buy a ticket) or bring your little ones to the family activities area. Seeing that it is construction season, organizers are encouraging people to walk, bike, carpool or Lyft to the event — they've even partnered with the rideshare service to provide a discount on your ride. This one-day music festival happening June 16 will feature big names and big sounds from Chastity Brown, Feist and Father John Misty — just to name a few. Presented by The Walker Arts Center and our friends over at The Current, the event will take place overlooking the recently renovated Walker Sculpture Garden. Tickets are $74 dollars — VIP tickets are $300 and give you access to the Walker's rooftop terraces among other goodies. OutFront Minnesota and Insight Brewing have teamed up to help celebrate Pride Month and the LGBTQ community with this party on East Hennepin Ave in Minneapolis. There will be unique brews, treats from the Go Bananas food truck and Butcher Salt restaurant, performances by drag kings and queens and inflatable unicorn jousting. The party goes from noon to 5 p.m. Saturday. Fair State Brewing Cooperative will be hosting a plethora of rare and tasty brews from around the country this Saturday. Located in Northeast Minneapolis, there will be two separate sessions for tasters, one going from 12 p.m. to 4 p.m. and another from 5 p.m. to 9 p.m. Obviously, the event is for those 21 years old and older, and organizers remind those planning to attend to either have a designated driver or make other plans to get home, pointing out on an event page that Metro Transit lines 32 and 10 stop within one block of the venue. You may have noticed that all these events take place in Minneapolis, the center of the I-35W@94 Downtown to Crosstown project. The $239 million improvement and reconstruction of Interstate 35W from 43rd Street to I-94 near downtown is now in full swing and will last for the next four months. Starting Friday at 10 p.m., both directions I-35W will be closed between I-94 and Hwy 62 until the coming Monday at 5 a.m. Also Friday, the ramp from southbound I-35W to 35th St. will be closed until fall of 2020 and the 24th Street pedestrian bridge — a favorite of photographers — will close over I-35W until fall of 2021. These ramps, also in Minneapolis, will be closing 9 a.m. Friday and reopening Saturday at 10 p.m. — northbound Highway 100 to eastbound Highway 62 and the right lane of eastbound Highway 62 after the Highway 100 exit ramp. 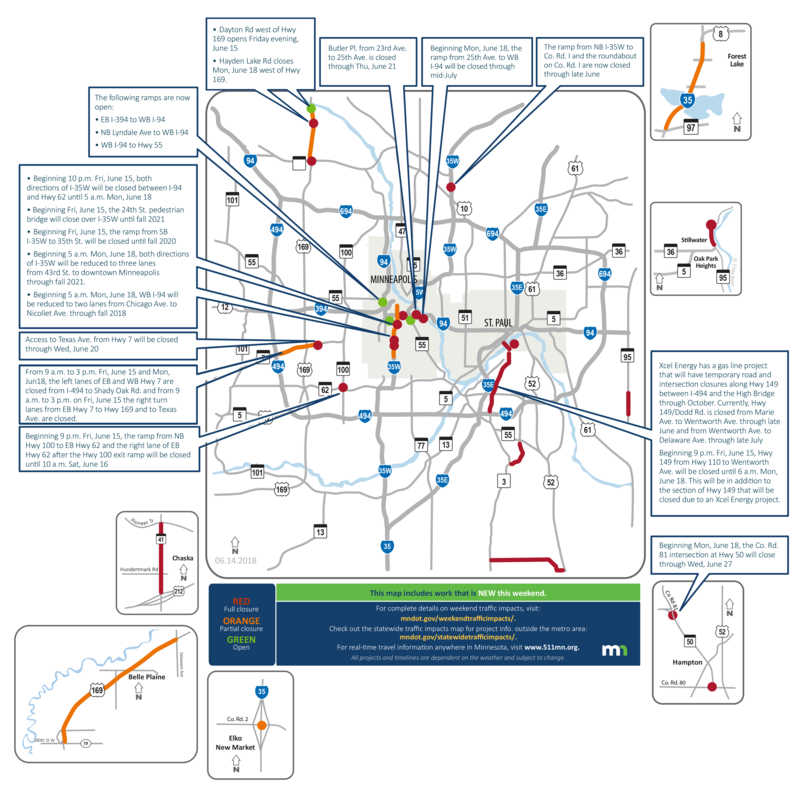 The Minnesota Department of Transportation has provided lots of information on detours and alternative routes in and out of downtown Minneapolis. Metro Transit is also pitching in to offer commuters alternatives if they don't want to deal with driving through orange cone country. Through collaboration with the city and MnDOT, the Metro Transit system has increased service by 40 percent, with additional park-and-rides and expanded trip times. But there's one important caveat — if you had planned to take the Blue or Green Lines all the way to downtown Minneapolis, plan instead on taking the bus at least part of the way. The downtown stations on both lines will be closed over the weekend as a number of repairs and improvements are made to the rails and the surrounding infrastructure. Buses will pick up the slack, replacing the Blue Line from Franklin Avenue to Target Field station and carrying the former Green Line passengers from Raymond Avenue to the same station starting at 6:15 p.m. Friday and continuing until early Monday at 3:30 a.m. So good luck, have patience, leave early and above all else, have fun! Sara Porter is an associate digital producer for MPR News.